It's been some time (about a month) since we deployed the drifters from the Algoa - so let's see how they've been doing out there in the ocean! (The other two buoys [70970,70973] are not in the system yet). You can see from the model numbers (SVPBD2) that these have barometers on board - so more data is available from these buoys than just position and sea surface temperature. 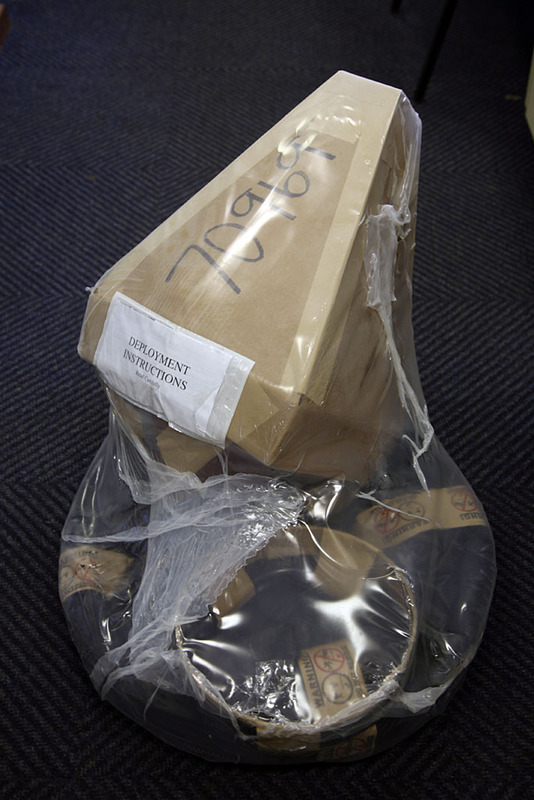 Very handy for meteorologists, too; these buoys were sent to us from the South African Weather Service. The WMO ID numbers are used to track the buoys across the world; entering them into the drifter tracking page on the PhOD site, or on NOAA's OSMC site will let us track them. So let's have a look! Looks like it got sucked straight into the Agulhas Current - it will be interesting to see what happens to it now - will it spin off into the Atlantic, or travel through the Agulhas Retroflection and then eastwards across the Indian Ocean? On the plot, you can see it's gradually heading south, offshore of the east coast of Madagascar. It'll be interesting to see how it travels from here! The most interesting plot so far! Looks like it's caught in some kind of eddy south west of Madagascar. The temperature plot looks more interesting too! Get the latest version here. 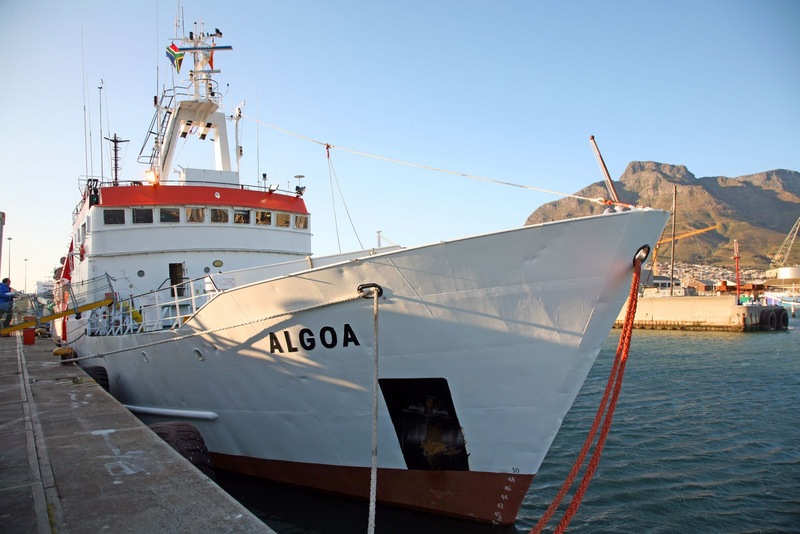 The Algoa will be heading off again in a week or so to deploy the Agulhas Return Current (ARC) mooring in partnership with NOAA - if your school or class would like to Adopt a Drifter, please fill out the adoption forms at NOAA's ADP website as soon as possible! All scientists regularly use all sorts of acronyms and jargon in their work and we sometimes assume everyone knows what they mean. Some of the acronyms don't mean all that much when spelt out in full either! I thought it would be a good idea to intersperse this cruise blog with "Jargon Buster" posts, which I hope will explain and illustrate some of these concepts. First up: Satellite Drifters! We've been talking about satellite drifters for several days now. So what are these things anyway? 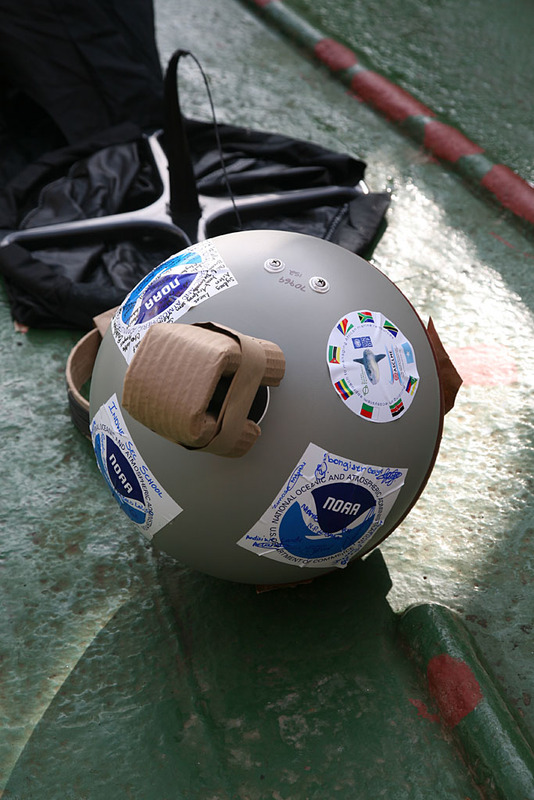 Essentially, satellite drifters are oceanographic ("ocean studying") instruments that give us a good idea of how surface currents in the oceans move over long periods of time.To the left, you'll see a diagram of roughly what a drifter looks like, courtesy of NOAA's Adopt a Drifter Program (if you want a closer look, click on it!). In addition to letting us know how ocean currents move (see the "Where is it now?" section below for information on how that works), all the drifters we deploy carry a sea surface temperature (SST) sensor, which measures the temperature of the water under the surface. Some of the drifters can also measure barometric (air) pressure, wind speed and direction, salinity and even ocean colour. What's the design all about? In the diagram above, you will have noticed a tube sticking out of the top of the buoy, then the buoy float itself; this tube is connected up to a barometer that measures air pressure (there was a time I though this was an antenna, but that's inside the main drifter buoy). If you're wondering why they're two-tone, the reddish part is actually anti-fouling paint to try and stop things like barnacles and seaweed from growing on the buoy, which may affect its accuracy (affect its drag), and if it gets bad enough, sink it! On the upper part of the buoy you can often see two stainless steel screws protruding (take a look at the image to the right); I once wondered if they were for checking battery charge, but they're actually submergence sensors that let the system know the drogue is still attached; other models have a strain sensor in the wire rope attachment under the float that performs the same function. Below the float is a length of plastic-coated wire rope, which connects up the the blue section. The blue section with the holes in it is what we call a "holey sock drogue". The holey sock drogue is there to basically "anchor" the drifter into the water column; if the drifter just consisted of the buoy alone, it would mainly be influenced by the wind or surface wind-driven currents; we're much more interested in knowing what is happening with the water in the upper ocean as a whole, rather than where the wind is blowing! The horizontal lines you see on the drogue are essentially hula-hoops that hold the drogue's cylindrical shape open; the bottom one is weighted to make it sink, and the top one is often slightly buoyant to help the drogue stay upright in the water column. The holes act a bit like the dimples on a golf ball (they affect its drag and how it moves through the water) - essentially, they're there to "disrupt the formation of organised lee vortices". Huh? Picture a rock in a stream (or a bridge piling) and the mini whirlpools that form behind it; those little whirlpools are lee vortices, and in the case of a buoy (which isn't fixed in place like the bridge or rock) affect the drag (how easily the object can move through the water) - and affect the accuracy with which the buoy tracks the actual flow of ocean currents. The middle of this drogue is at about 15m below the surface of the water, so these instruments are pretty long! 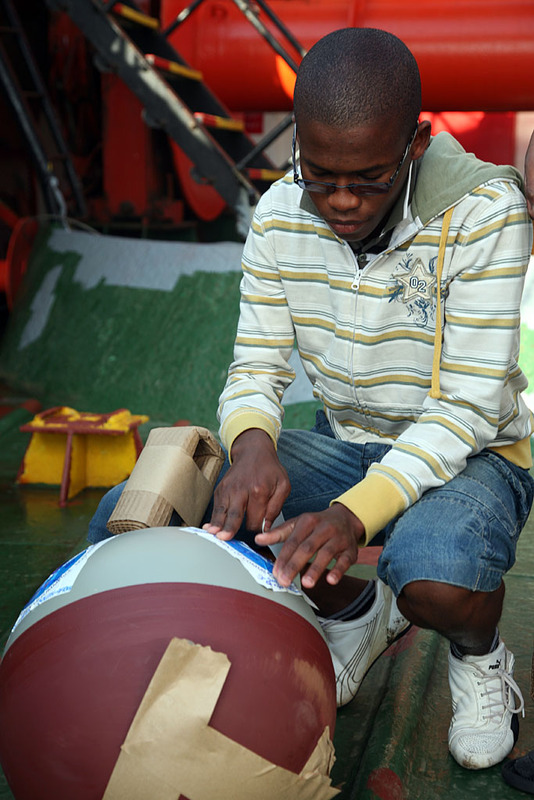 New drifters have several biodegradable (I've often noticed that one of the first questions enquiring young minds in South Africa make about deployed oceanographic instruments concerns any pollution they may add to the oceans!) 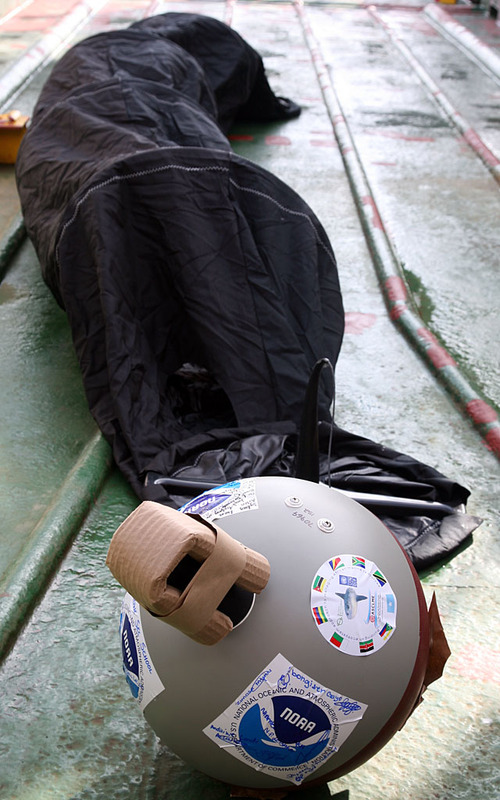 paper fixings that make them easier to handle; bands around the drogue make it easier and neater to deploy from the ship; a cardboard ring stops the wire rope from tangling and a small magnet paper taped on falls off once the buoy is in the water; this magnet activates a relay inside the buoy and is essentially an on/off switch that saves the battery power until the drifter is active.We remove the outer plastic wrap and the bulkier bits of cardboard and dispose of those back on land. Inside the buoy you'd find some battery packs consisting of "D" cells, a radio transmitter and a some electronics that take care of the sea surface temperature measurements, monitor the submergence or tether strain sensor and translate this information into numeric data and beam this back through the ARGOS network to a data centre along with the drifter's unique ID number. I've often wanted to crack one open and take pictures of the innards, but I can't justify "wasting" a useful piece of scientific equipment like that. Hopefully, one day I'll get hold of an old one to "cross section", or we'll persuade the manufacturers to send us pictures of the innards! Whilst some satellite drifters have had a GPS or similar device on board to obtain and transmit their position (and most satellite drifter manufacturers offer it as an option), the satellite drifters we deploy do not use GPS (sincere apologies to everyone I've ever told that this is how it works!). The real method is even more interesting. The satellites transmit their data to a network of satellites known as ARGOS. The position is calculated based on the Doppler shift of the radio signal from the transmitter on the satellite drifter towards the orbiting satellite that receives the signal. Not using GPS has two benefits; 1) it makes the drifters simpler and therefore cheaper and 2) it takes less battery power so the drifter can be smaller or use less batteries - or last longer for a given battery pack. Depending on the quality of the fix obtained, this non-GPS position finding can be accurate to within about 150m to 1,000m - more than accurate enough to track ocean currents. If you're not familiar with Doppler shift, think about the last time a police car, fire truck or ambulance drove past you; you may have noticed that the apparent pitch ("tone" or "note") of the sound went up as it came towards you, and then rapidly went down as it went away from you. Even a car's exhaust sound will show this effect (neeeeeeeiiiiiyeeeeeeuuuuurrrr!). This also happens with electromagnetic radiation like light and radio waves; the "red shift" of stars observed by astronomers suggests the universe is expanding (the stars are travelling away from each other and their light "shifts" to a redder [longer wavelength] spectrum; if a star was coming closer to you, its spectrum would shift towards the blue [shorter wavelength]) - and in the case of the drifters, the apparent frequency of the radio signal increases and then decreases as the satellite moves towards the drifter and past it. Coupled with some nifty maths and (well founded) assumptions about the shape of the earth, you can quite accurately work out the transmitter's position; depending on how confident the system is about the quality of the position data, it will be tagged to let the data centre know how reliable the position fix is. This Doppler Shift-based location calculation is nicely illustrated on their site here. Everything you could possibly want to know about ARGOS is covered in their extensive manual. The basic Surface Velocity Program (SVP) drifter with Sea Surface Temperature probe are about US$1,500 for one. More complex models cost more, depending on what instruments they have on board, up to around US$3,000 or more for extra features. Why do we deploy drifters anyway? And why do they measure sea surface temperature (SST)? Great questions! First the drifters themselves. Being more or less "anchored" in position with the water mass they're tracking by their drogues, the drifters track the movement of ocean water below the surface without being overly influenced by wind. Over time, lots and lots of observed drifter "tracks" let us build up a detailed picture of how the oceans move, and we're beginning to better understand just how complex some of these currents can be (click on the picture of the drifter tracks further up the page for a closer look). And, unlike a research vessel, which can cost tens of thousands of dollars a day to keep at sea, a drifter will send us data for over a year for around $1,500 (more complex drifters are more expensive). Clearly, if we're going to understand much about the oceans at all, we need to understand how the water moves - so knowing the surface currents is an important first step. 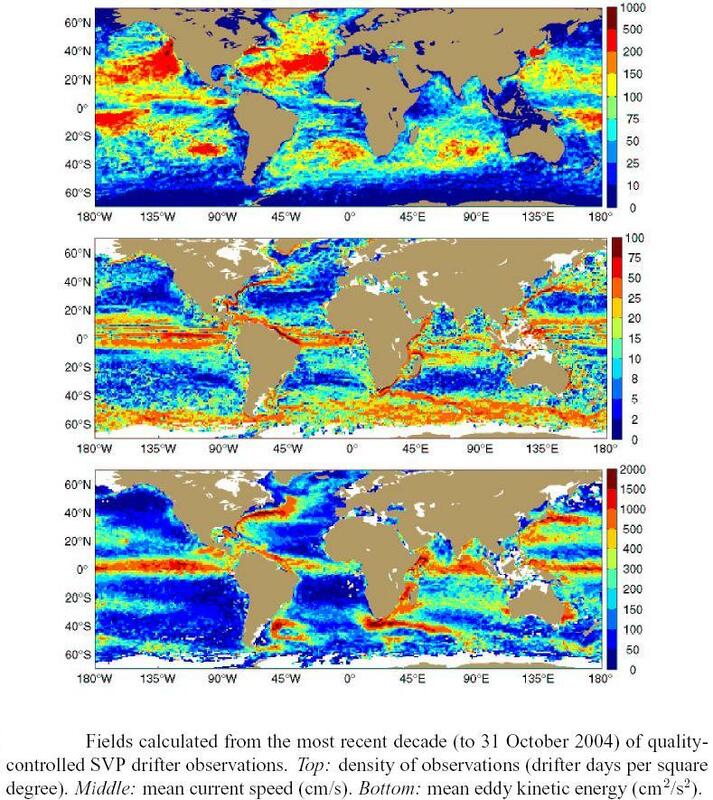 The global Surface Velocity Program aims to have at least one drifter in every 5ºx5º grid of the ocean - a global network of 1,250 drifters active at any time. Secondly, SST. Sea Surface Temperature, if you haven't already worked it out, it the temperature of the seawater near the surface of the ocean. The buoy has a small thermistor (a temperature measuring device that works by measuring the [known] change in resistance of an electrical circuit due to temperature fluctuations) poking out from the underside of the float. This device accurately measures SST. We can also measure SST from space using remote sensing (a topic of a later Jargon Buster! ), but this data needs calibration, and in situ ("on the ground" / "in place") temperature sensors like the drifters are invaluable for calculating the calibration and correction factors for satellite SST data; this process is sometimes also referred to as "ground truthing". Remote sensing also doesn't work very well when there is cloud cover, so it helps us "fill in the gaps" when there is heavy cloud obscuring our view of the ocean from space. Temperature is one of the most easily measured ocean water parameters, and with enough readings from all over the globe, gives us much useful information about how much and how quickly heat travels around the planet (vital in predicting weather and understanding climate). If you'd like to see the kind of results you can get by combining a lot of drifter measurements like this, take a look at this illustration over at the Physical Oceanography Division of NOAA's Atlantic Oceanographic and Meteorological Laboratory. Visit NOAA's Adopt a Drifter Program to learn how your school or class could adopt a satellite drifter and use the same data that scientists use to learn more about the ocean. A very comprehensive overview of the global drifter programme is available from here; it will also tell you in detail about the small errors and inaccuracies in the data. A list of all drifter deployments and model types, and where,when and by what ship they were deployed. If you'd like to make any comments on any of the blog posts, you can do so with the links below each post, or feel free to contact me through the ASCLME website here. The ear bones are called "otoliths" and are very useful in determining the age of fishes, particularly in temperate waters; in tropical waters they are often less useful - but the analogy to rings in a tree trunk is pretty apt! Some fishes also deposit growth rings on their scales, but these are generally less reliable. Fishes that live in waters where the temperature varies little throughout the year (like the tropics!) have much less pronounced "rings" on their otoliths that those that live in regions with marked seasonal temperature changes, so interpreting tropical otoliths is much more challenging. Using the right techniques, you can sometimes even see how many days a fish has been alive for. It's important to verify this ageing method; scientists who want to verify the accuracy of this ageing technique in a particular species will often tag a (living) fish for later identification and inject the fish with an antibiotic called tetracycline, which permanently stains the otolith in a ring on the day it is injected. The fish is then released, and when it is recaptured, the otolith is examined under UV light, which causes a prominent glow in the stained ring on the otolith and allows you to verify how regularly bands are deposited. 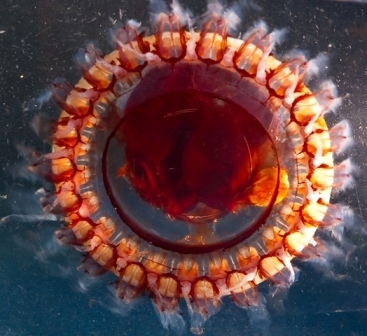 With regards to the bioluminescent bacteria in anglerfishes, the anglerfish supply nutrients to the symbiotic bacteria that live in their "lures", and the bacteria use this to grow, reproduce and - of course - produce light. The luminescent chemicals are all contained within the bacteria; they are similar to the luciferin and luciferase system you may be familiar with from fireflies (and those "snap" glow sticks). Many dinoflagellate algae produce bioluminescence too - not to attract prey as in the anglerfishes, but instead to attract predators to eat would-be dinoflagellate predators, or perhaps to confuse potential dinoflagellate predators with a burst of light. Chlorophyll a is one of the most important photosynthetic pigments in plants. In a device called a "fluorometer", commonly attached to a CTD, pulses of UV light excite chlorophyll a in marine algae within the water column; during the time the light is off, a sensor measures the amount of red light given off by the chlorophyll as it returns from its "excited" state to its "resting" state. This gives a measure of the amount of chlorophyll a in the water, and a measure for the productivity of that water (how much plant matter - and therefore food - is available to the ecosystem in that area). You can find some simple experiments (and pictures) with extracting chlorophyll and seeing this effect at this link. Keep the mixtures as cold as you can, and in the dark if you're not using them, as the chlorophyll quickly degrades otherwise. If you don't have a centrifuge (who does at home!?) you can pour the mashed up residue through a filter paper (a paper coffee filter works nicely). A little bit of sand helps to macerate the tissue when you're grinding it up. 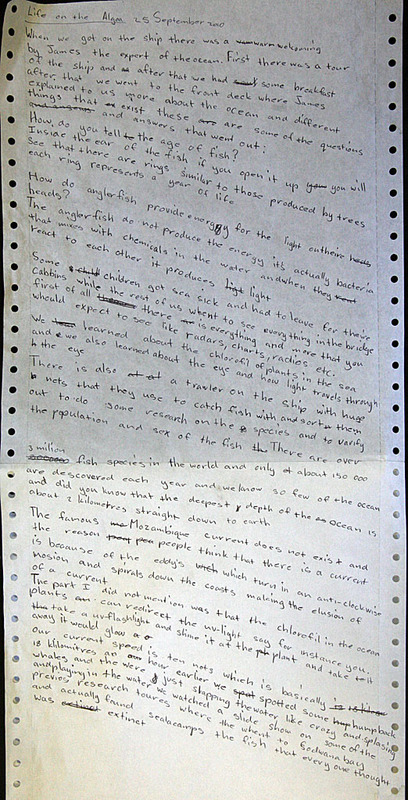 Our young researcher slightly exaggerated the numbers of fish species in the sea; the Census of Marine Life estimates that there may be as many as 20,000 species of marine fishes (over 15,000 are currently described), and around 160 species of fish are described (identified and given a scientific ["latin"] name) every year. Including freshwater fish species, there are well over 30,000 species in the world. The deepest part of the ocean is Challenger Deep in the Marianas Trench, which is around 11,000m deep; on average, the oceans are about 2,000m deep. Humans have been to the bottom once, in 1960 in a vessel called the Trieste. No manned vehicle currently exists that can make it to that depth safely. The highest mountain on earth, Everest, is currently measured at 8,848m above sea level. He's quite correct about the "Mozambique Current" not existing as a strong western boundary current as it is still represented in school textbooks (and old oceanography ones too!). 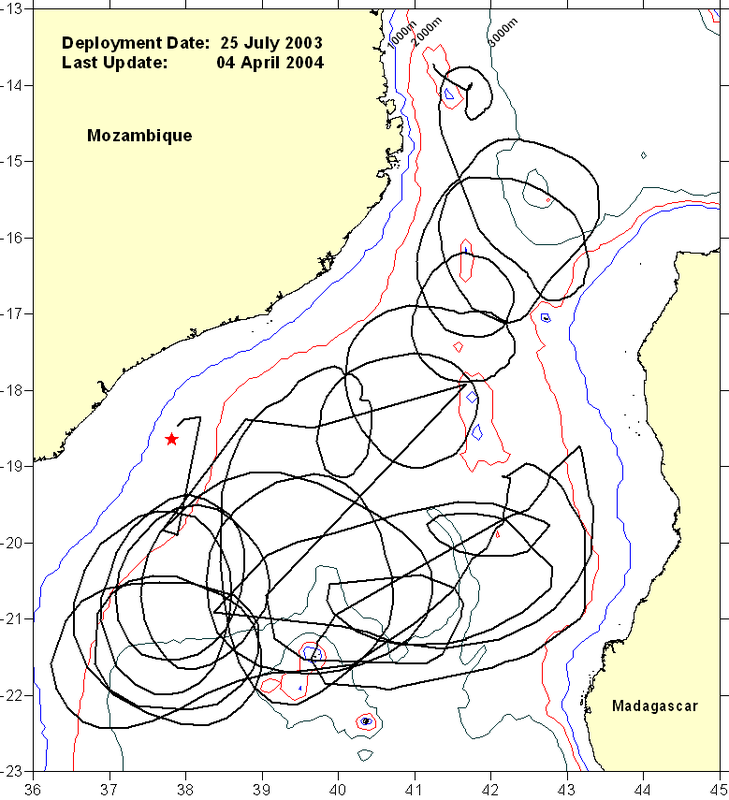 Since around about 2002/2003, more and more evidence has been mounting that the current flow in the Mozambique Channel actually consists of a series of anticyclonic eddies, which give the illusion of a strong southward-flowing current along the Mozambique coastline. At some stage, these eddies merge with the Agulhas Current, which flows down South Africa's east coast. It appears that when these eddies join the Agulhas Current, they cause events known as Agulhas Pulses and may also be responsible for the shedding of Aghulas Rings, which take warm, salty water up as far as the North Atlantic, and may influence climate and weather globally. In addition to remotely sensed data of sea surface temperature, mesoscale satellite altimetry and ocean colour, a series of moorings, known as LOCO, have been extremely important in learning more about these eddies and the flow in the channel. Satellite drifters (see picture to left) have also been instrumental in providing very obvious data on just how circuitous the flow in the channel can be. 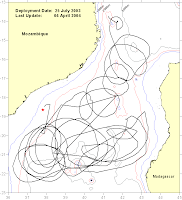 One of Algoa's objectives on this cruise, together with partners from the Royal Netherlands Institute for Sea Research (NIOZ) in the Netherlands, is to service this array and extend it out from the south east corner of Madagascar. If you're interested in the region's oceanography, Professor Lutjeharms wrote us a very comprehensive overview of it for the ASCLME website when the Project began. We're learning more and more about this surprisingly dynamic part of the world's oceans, and its vital role in the global weather and climate is increasing the amount of interest (and important international research partnerships) in the region. Coelacanths are indeed found near Sodwana Bay near the South Africa's border with Mozambique. 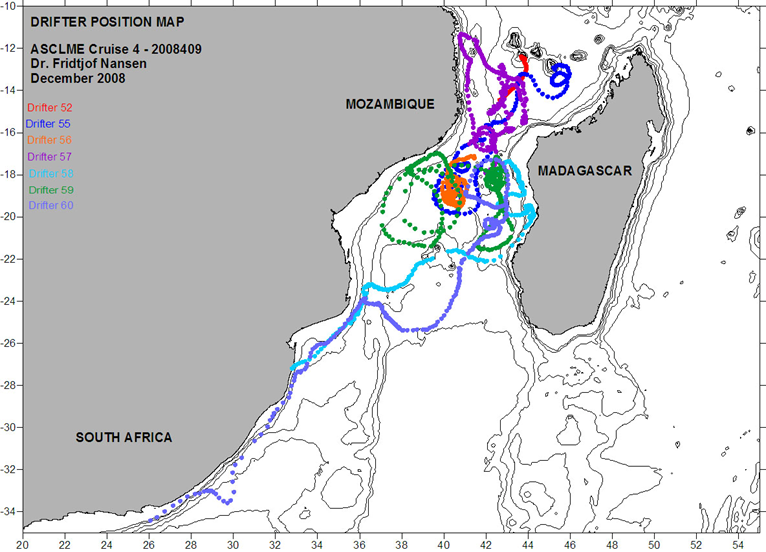 This discovery by a group of SCUBA divers spurred the creation of Phase I of the African Coelacanth Ecosystem Programme (ACEP) and then Phase II of the Programme, who are important partners of the ASCLME Project. Life on the Algoa - according to a student. How do you tell the age of a fish? How do anglerfish provide energy for the light on theire heads? first of all there is everything and more that you whould expect to see like radars, charts, radios etc. We learned about the chlorofil of plants in the sea and we also learend about the eye and how light travels through the eye. I was impressed with how much of the overwhelming amount of information he remembered during a very long day - with a bout of seasickness to overcome too! As we were saying goodbye at the harbour in Port Elizabeth, the same young scholar told me as he came running past "You must keep studying the oceans, it's too interesting and important!" - motivation indeed! In the next post, I'll clarify some of these points for your interest. 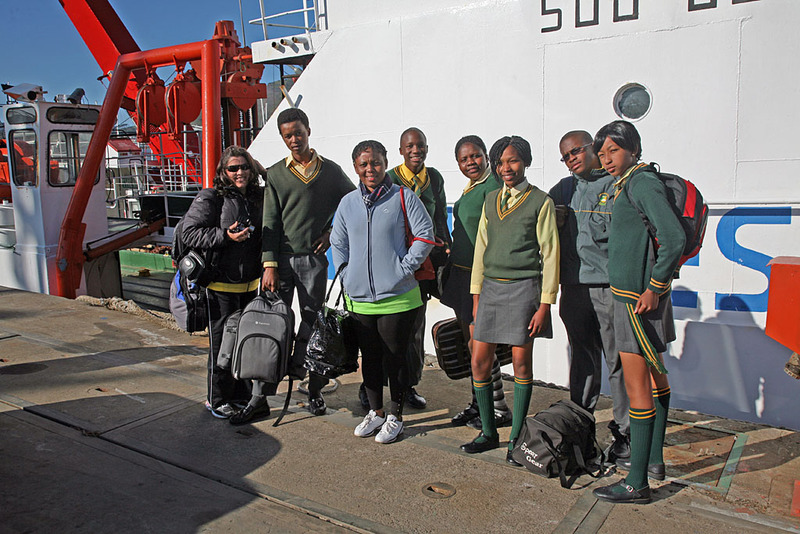 We sailed into Mossel Bay this morning around 8am, and quickly swapped the students from Indwe Secondary School with a group of younger students from several schools around George. 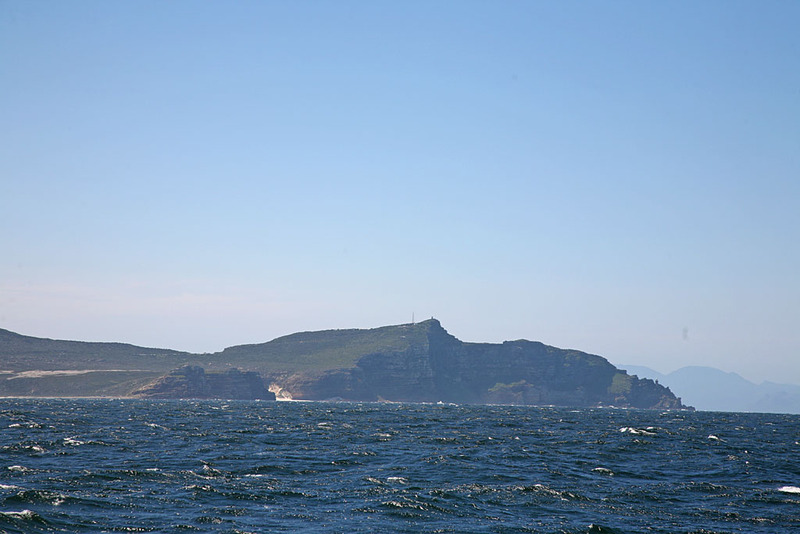 We're currently about to sail past the Knysna Heads here. After breakfast this morning, most of the Indwe Secondary School students were feeling a little better, so I took a drifter (70969) out of storage and very quickly explained how it works - time was pressed as they had to get off shortly thereafter. 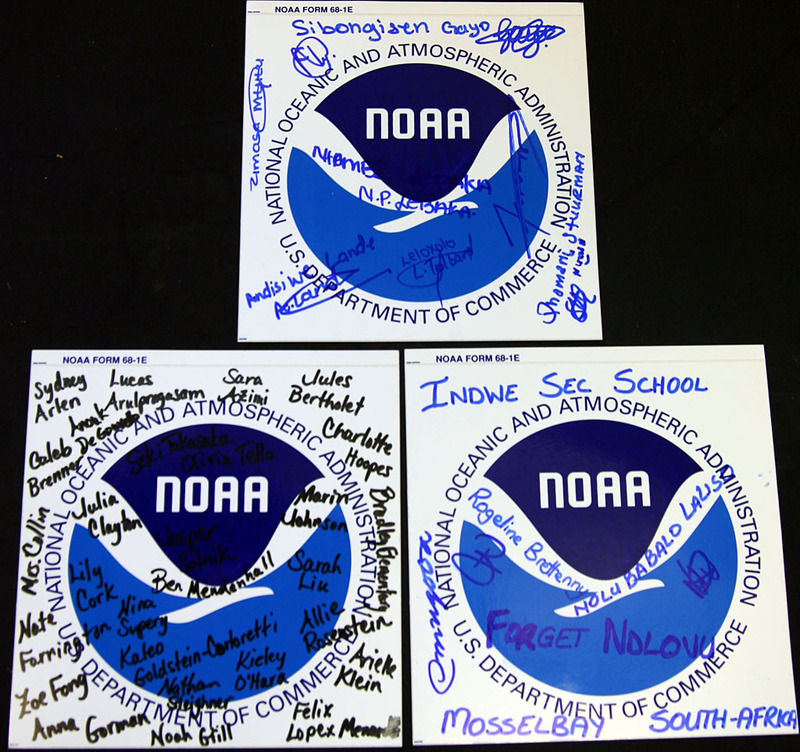 The students applied the NOAA stickers they had earlier signed, together with one from Bradley Elementary School in the USA. We had thought about actually deploying the drifter on this leg, but we stayed fairly close inshore on our leg to Mossel Bay, never much more than 15 Nautical Miles from land; the Captain and the scientists I spoke to thoughtt the drifter was most likely to wash up ashore within a few days that close to land, which wouldn't be a very exciting deployment for the students to follow! My colleague, Tommy Bornman, will ensure that the 5 drifters we put aboard are deployed in the Mozambique Channel as they cross towards Madagascar, or along the southern coast of Madagascar. The drifter may end up entrained in one of the Mozambique Channel eddies, and that will certainly be interesting to follow! The new group of students and I spent most of the morning on the foredeck in glorious sunshine, with the students and teachers asking me questions about all sorts of aspects of ocean science and life in the sea and on board boats, ranging from how does a boat float, to what happens to the oil in a ship if it sinks or catches fire, the effects of the Horizon Deep oil spill and we even covered some genetics, life history strategies (including a brief foray into the world of intra-uterine cannibalism, as seen in a fairly common shark species (the ragged tooth or sandtiger shark) and evolutionary biology! In a short while, we'll see who feels up to touring the bridge; we're promised some rough weather a bit later, with a 30 knot wind, which will definitely give us a bit of a wild ride until we reach the shelter of Algoa Bay, which will be around 3am this morning; we'll start docking procedures into Port Elizabeth around 7am. (This post was written several hours ago - I've been waiting for a cellphone signal before being able to post it!). I'm sitting on the FRS Algoa in Cape Town Harbour, having enjoyed a braai on the trawl deck during Heritage Day! Tomorrow morning at around 9am, the ship will leave the harbour and make its way towards Mossel Bay. 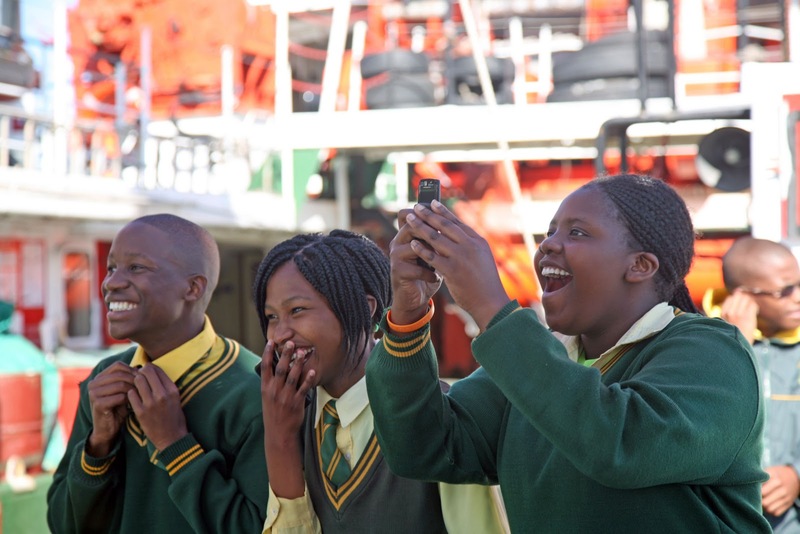 On board will be several high school students from the Mossel Bay and several teachers, who will experience first hand a little of what life is like aboard a research vessel, and learn why we go to sea aboard in the first place. In Mossel Bay, we'll give some more students and teachers from George a chance to do the same thing, before the ship docks in Port Elizabeth. From Port Elizabeth, the Algoa will travel northwards towards Toamasina in Madagascar. To the North of there lie a series of moorings which the ASCLME Project deployed in partnership with NOAA in 2008. 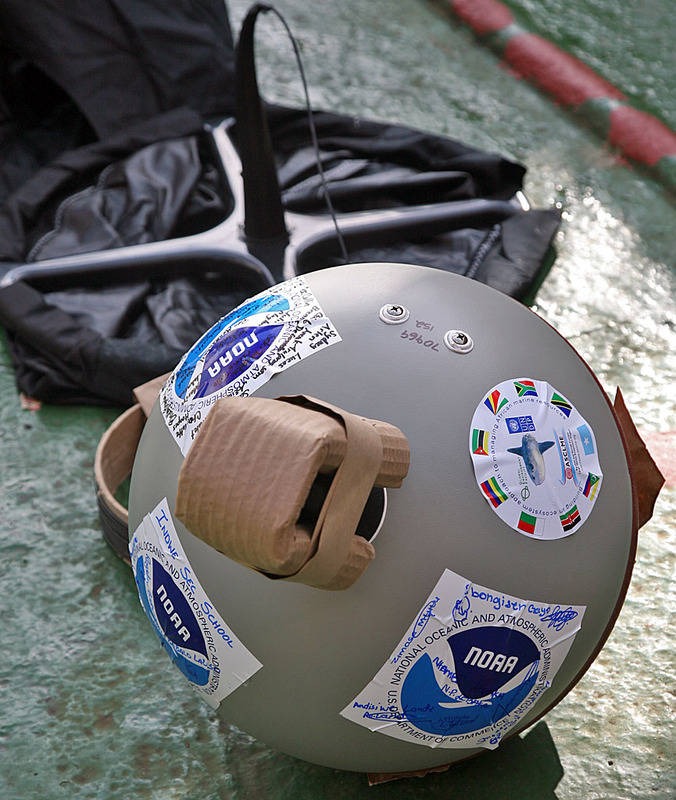 These ATLAS mooring buoys need regular maintenance. Unfortunately, they lie in the "High Risk" Piracy zone of the Indian Ocean, so the Algoa will be escorted by a Seychelles Coast Guard vessel during that leg. If we can make updates whilst up that way, please note we won't be giving detailed activity notes as it represents a security risk to do so! On the way to Toamasina, in partnership with Dutch researchers, we deploying some LOCO moorings, which measure ocean currents and have already helped us to understand the complex flow patterns in the Mozambique Channel; we'll be extending this array of moorings off southeastern Madagascar. 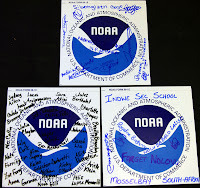 The students and teachers on board are taking part in NOAA's "Adopt a Drifter" Program, which pairs students from a school in the USA and a school overseas (South Africa in this case), who jointly "adopt" a satellite drifter, and use this as an opportunity to learn more about the oceans and how they function - using the same data scientists use, following their drifting buoy in near-real time as it journeys across the ocean. I'll be on hand to explain what the ship is used for, some of the instrumentation on board and why it's important to do this kind of research. The IUCN-led Seamounts Project, funded by the GEF, is also undertaking cruises aboard the Dr. Fridtjof Nansen. Rather have our readers go to two places for information on this joint ASCLME/Seamounts Project Cruise, we've decided to redirect you to out partner's blog - so, for more information on this exciting expedition, please visit the 2009 Seamounts Cruise Blog. This blog is also being syndicated by BBC News on their Earth News section.